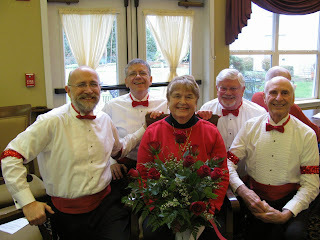 Prior to Valentines Day, you can order a gift of Singing Valentines for a loved one, performed by one of our quartets. Click here for full information on this wonderful opportunity. Bridge Town Sound is eager to provide chorus or quartet entertainment for your group or event. We provide entertaining musical packages up to 45 minutes in length. If you would like to talk to us about bookings, visiting, or upcoming shows, call us at 971-238-SONG (971-238-7664), or email to dgilman@bridgetownsound.org. We do not have set rates for full chorus performances, but as a guideline, we feel $300 to $500, depending on the event, is reasonable. We will consider requests on an individual basis, and will perform for less for some nonprofit organizations. For payments, our organization name, Tax ID, and mailing address are: PORTLAND METRO CHAPTER / 26-0017357 / 10801 SW Creightonwood Pl, Portland, OR 97219 (for mailing only). Download our W-9 by clicking here. We do not have a set rate schedule for quartets, but $100 to $300 is a guideline, depending on the event, travel time and other variables. Rates are established on an individual basis.